The following contains information based on conversations with factory workers and others who are familiar with the vehicle assembly process at the Lynch Road plant in Detroit. None of this information is backed up by factory documentation. That said, I am reasonably certain that the following article will help demystify the Gate Series and Line Sequence numbers found on Lynch Road fender tags. First, what are talking about here? Take a look at the fender tag below. It is from a 1970 Plymouth Belvedere assembled at the Lynch Road assembly plant. On the top line are two numbers, 09123 and 200294. These are commonly referred to as the Gate Series (or Base) and Line Sequence Numbers. Similar numbers are found on Lynch Road tags from 1969 to 1980. But what do they mean? Let's back up a bit and look at how the vehicle assembly process started. All the individual body components and sub-assemblies were assembled into a unibody shell in the metal shop. Then the bodies were stored in an area of the plant called Body In White (BIW) temporarily until they were released to the main assembly line. 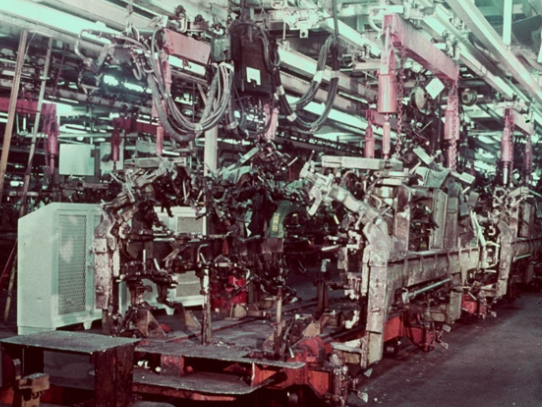 The way the bodies were assembled started with the floorpans, forward frame rail sections and trunk section being welded on a type of conveyor that moved along the floor. The pieces were secured to huge moving fixtures hanging from the ceiling called sidegates which held everything in place for welding. After the floor section was assembled, the rockers, A-pillars, inner fenders, inner quarters and outer quarters were attached, again using sidegates, or "gates". The unibody was built up from bottom to top this way along a gate series. In the above example, the body went through gate series 09. It appears there were at least 32 numbered gate series in the Lynch Road plant (01-32). This does not necessarily mean there were 32 physical series; the numbers may have changed throughout the production year. It appears that each gate series was used to assemble primarily, though not exclusively, one body type at a time. For example, a large percentage of '69 Dodge B-body hardtops (bodystyle 23) seem to have been through gate series 18 and 23, the sedans (bodystyle 21) mostly seem to have been through gate series 10 and 26. '69 Plymouth B-body hardtops went through gate series 03, 05, among many others, while the sedans mostly went through gate series 01 and 08. The above referenced car was assembled on gate series 09 and was the 23rd body to go through that gate series on that day, since the next set of numbers apparently starts at 101 each production day. The 23rd car (123) through the ninth gate series (09) equals 09123. Next is the Line Sequence Number, 200294. This is the total number of bodies that have entered BIW since the beginning of the production year, beginning at number 100001 like a Sequential Build Number. Notice that our example number is a slightly higher number than the Sequential Build Number of the VIN, which is 199202, indicating that the metal shop was producing unibodies ahead of the production assembly line. This is usually the case, but not always. I have many tags in my collection that are the opposite. That is, the Sequential Build Number is slightly higher than the Line Sequence Number. But from my sampling, the two numbers are always pretty close to each other. Bear in mind that cars did not necessarily enter or leave the assembly line in Sequential Build Number order, which can be seen by the wide variation of these numbers on certain models with similar Scheduled Production Dates, like the '69 A12 440-6v cars and '70 Superbirds. So it's possible that a high Sequential Build Number was released for production before that many bodies had been assembled. These numbers aren't very exciting, but now we have an idea of what they mean and why they're there. Lynch Road was the only plant to stamp these numbers on fender tags, which illustrates one of the differences in plant procedure. As far as I can tell, no one has published this information before. If you have information concerning these numbers, please contact me. Many thanks to Kevin McCabe and Greg Lane for their assistance with connecting the dots regarding these numbers and assembly line procedures.